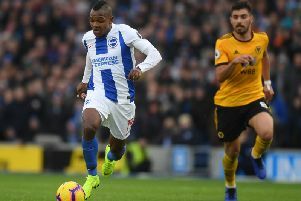 Brighton manager Chris Hughton suggested that the quality of the Premier League is the main reason behind their seven game winless run. Albion were beaten 3-1 by an inform, albeit relegation threatened, Burnley at the Amex yesterday leaving them just three points above the bottom three. Hughton said: "We don't want to speak that way [about a relegation battle] but we are a level of club that is going to have ups and downs. People said we were comfortable in the league but we never felt that. "Everything is not going to be smooth for us. We know how difficult this league is and the quality their are teams below us who can all win games. This is a time to make sure that we are aware of that and we need to get points. That will be no different to any other stage of the season." Hughton felt his side were unfortunate to come up against an inspired Tom Heaton, who made several superb stops to deny Albion taking the lead in the first half, but urged his players to be more clinical in front of goal. "Heaton made some very good saves and at the moment, we probably needed to get a goal," Hughton added. "The last two homes games were a really good performance. Last time out, here, against Watford, we came up against a very good goalkeeper and again we have't managed to sure despite getting into some very good positions. "We need to be better in front of goal. We need goals from our forward and contributions from elsewhere as otherwise, like today, you leave yourself vulnerable." Hughton denied that their recent form is due to a lack of confidence. He said: "It's always very easy to speak after a disappointing defeat on the back of two good performances against West Brom and before that against Watford which was one of our best performances of the season. "I can't say it's been a lack of confidence because it hasn't been the case. On today's performance, we just didn't do enough to win the game."